During the first quarter of 2008, as Bear Stearns teetered on the edge of illiquidity, foreign holders of US$ financial assets contributed $9.3 trillion to US credit markets. 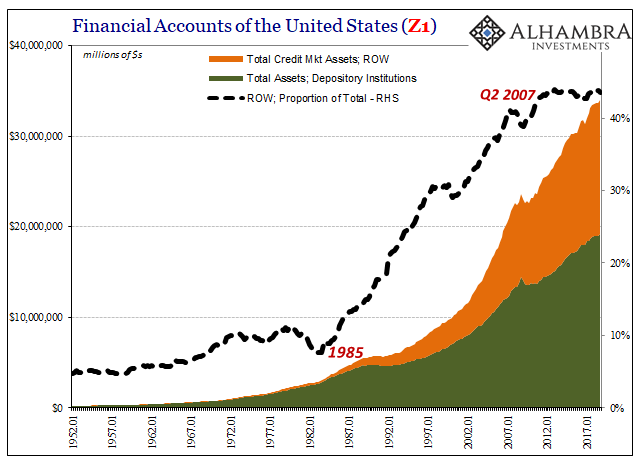 According to the Fed’s Z1, the Financial Accounts of the United States, it tells us that’s the amount they held in possession from outside the American geographical boundary. Considering at the same time US depository institutions reported a total of $13.4 trillion in all assets, overseas agents represented a huge chunk (an astounding 40% of this combined total) of bank-driven domestic credit. It wasn’t always this way. There had always been a somewhat robust financial participation originating elsewhere (from the US perspective) throughout the country’s history. In terms of these modern statistics, it was steady at about 5 or 6% throughout the fifties and early to mid-sixties. By the time the Great Inflation sparked, right around when the eurodollar system fully matured, suddenly foreign sources were all over domestic financial markets. The proportion hit 10% as early as 1972, the eurodollar fully supplanting Bretton Woods long before then, on 30% annual growth. It was still ~10% by 1985, domestic credit expansion at that time matching this foreign influx when ROW really took off (Rest of World, in Z1 categorization). Eighty-five was the year eurodollar futures (introduced in 1981) and interest rate swaps markets were standardized (ISDA) on what was the old Chicago Board of Trade. Throughout the nineties, especially when domestic credit sources were struggling with the S&L crisis, ROW was there to pick up the slack (and then some). As late as Q2 2007, growth in this overseas credit influence was still better than 20%. Why were there so many dollar swaps offered by the Federal Reserve during the depths of the 2008 crisis? Why were European authorities nationalizing foreign banks because of what seemed to be US subprime mortgages? ROW.